Lindy's Thoughts: E3 2010 Day...Zero? The Director gives us his random musings on the non-first day of the show. E3 2010 is Coming...and NWR is There! Our intrepid band of adventurers will have all the E3 coverage you've come to expect! Jon visits GameStop in search of a free disc and gets more than he bargained for. Late last week I stopped in at a GameStop at a local mall to pick up Capcom's free Monster Hunter Tri demo disc. I stopped in on my lunch break, and thanks to several nearby schools the place was, predictably, a zoo. A large crowd is something I can handle, but what I have a harder time stomaching is the chain's borderline dishonest customer service. We grows up, and we grows up, and we grows up. Would you let this man run your website? Is it March 7th again already? My, how the years fly by. Why it seems like only yesterday we were celebrating the 10th anniversary of the site, and here it is the 11th anniversary already. And of course, Nintendo World Report just keeps chugging along. The launch of the PSP draws ever closer. Jon examines what Nintendo can do with its DS to steal Sony’s thunder in March. 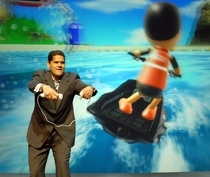 What will compel consumers to buy Nintendo's GameCube? Veteran writer Jon Lindemann offers this analysis as his first contribution to PGC.